Crop and optimize PDF for small screen devices. Is there a better alternative to PDF Resizer? Is PDF Resizer really the best app in Applications category? 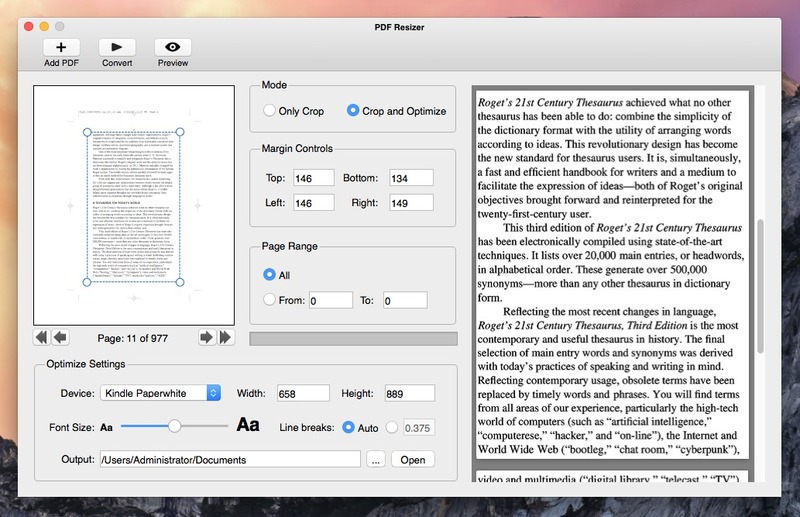 Will PDF Resizer work good on macOS 10.13.4? PDF Resizer lets you remove the blank edges or margins from the PDF pages to give the documents a more professional and consistent look. It also can optimize PDF documents for small screen devices (Kindle, Nook, Sony Reader, etc.) or smartphones, so that all PDF documents are easy to read on small screen readers. PDF Resizer needs a rating. Be the first to rate this app and get the discussion started!